MAC memory card data undelete software recovers your lost precious moment digital pictures, memorable snapshots, mp3 songs and other important data from all types of memory cards including SD card, MMC card, CF card, xD picture card and other types of memory cards available in the market. » Recover accidentally deleted audio, video and picture files from corrupted memory card. » Restore missing holiday photos, cute baby snaps and wedding photographs. » Regain lost images which are saved in various types of file format regardless of their extensions. » Retrieve deleted audios, videos clipping, mp3 songs from inaccessible MMC card. » Sony, Transcends, Kingston, Olympus, Super Flash, Super Talent and many more. 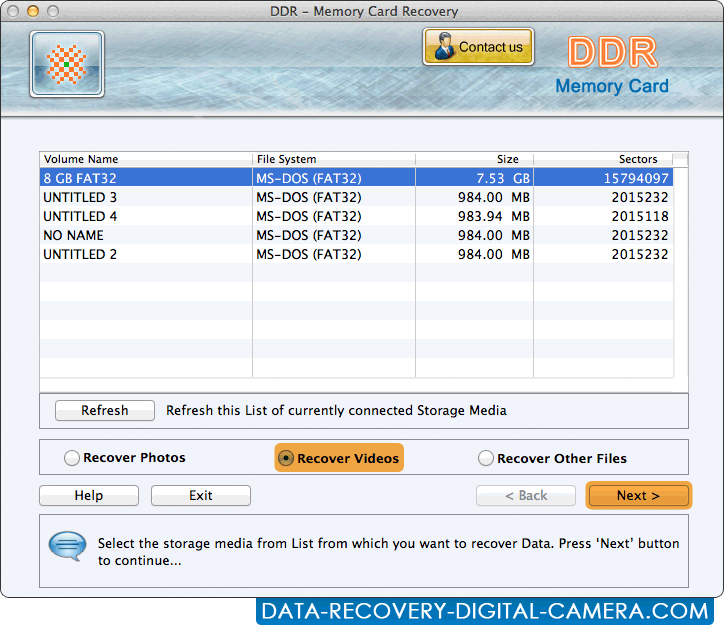 Recovers lost digital photos, images from virus infected memory card. Restore missing party albums, anniversary photographs and other important data at an affordable price. Data recovery from higher capacity memory cards: Software supports fast data recovery from all capacity (even higher capacity) of memory cards without any data loss. Provide preview facility: Application offers facility to display preview of your recovered data before their actual recovery. Uses deep disk scanning algorithms: Utility uses deep disk scanning algorithms to recover lost encrypted and compressed files of any extensions.